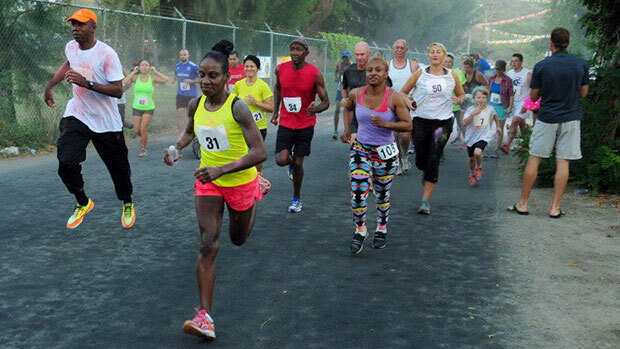 MARCH 26—Reuben Stoby improved his own course record to bring the curtains down on the Dive BVI 5K Series Color Run on Saturday in Virgin Gorda, that attracted 56 participants and raised $378 for the BVI Cancer Society. Stoby chopped 23 seconds off the 18 minutes and 46 seconds course record he established in his last race to win in 18:18, as the only runner under 20 minutes. Rosmond Johnson—who won the overall women’s division in the series—overhauled NiMade Oniasih to win in 22:31. She said being behind helped her a lot. “This morning, I was really tired and I was thinking I’m not going to do it again, but I pulled it off,” she noted. “NiMade was ahead of me most of the time and I caught her on the last bit of the hill coming back, then I left her there and I had a sprint finish and I didn’t see her. Julius Farley who was second in 20:00, was the overall series winner with Virgin Gorda resident Curwin Andrews taking the second spot. Johnson took the women’s division with NiMade Oniasih second overall. Final results. Men: 1. Reuben Stuboy, 18 minutes and 18 seconds. (New course record. Old record, Stoby, 18:41). 2. Julius Farley, 20:00. 3. Ravi Sukhu, 20:03. 4. Curwin Andrews, 20:16. 5. Emrol Amsterdam, 20:41. 6. Keith Williams, 21:15. 7. Zebalon McLean, 21:40. 8. Paul Hubbard, 21:42. 9. Alan Cundall, 21:51. 10. Rainford Legair, 22:08. 11. Ezron Simmons, 22:56. 12. Pablo Olarte, 25:12. 13. Bob Lanobrau, 26:17. 14. Lewis Munn, 28:25. 15. Wilbert Samuel, 29:23. 16. Scott Butz, 29:28. 17. R. Kyle 21:03. 18. Stephen Beard, 32:37. 19. Zoltan Birinyi, 33:49. 20. Joshua Ramproshad, 34:00. 21. Will Seddon, 38:36. 22. Aaron Seddon, 38:36. 23. Atlas vanSickle 45:58. 24. Jermain Abrams, 58:48. 25. Jadon Abrams, 58:48. 26. Jaden Abrams, 58:48. Women: 1. Rosmond Johnson, 22:31. 2. Oniasih Ni Made, 23:27. 3. Berenice Garcia, 26:58.,4. Eva Askulv, 26:58. 5. Leanne Munn, 27:09. 6. Arielle Goodley, 28:26. 7. Sarah Graham, 28:37. 8. Becca Knight, 28:51. 9. Roslyn Gilbert, 29:27. 10. Debbie Ridgeway, 30:20. 11. Emer Coonan, 20:49. 12. Clair Burke, 31:17. 13. Coleen Moorehead, 33:47. 14. AJ Syrett, 35:07. 15. Tara Murphy, 35:07. 16. Beth Besom, 35:40. 17. Jude Holmes, 36:21. 18. Chris Yates, 39:40. 19. Luana Casoni, 45:21. 20. Laura Fox, 46:01. 21. Michela Paradisi, 48:08. 22. Chloe King, 48:08. 23. Bety Biancardi, 49:42. 24. Lynn Hawkins, 49:42. 25. Stephanie Williams, 58:57. 26. Tunbi Adogba, 58:57. 27. Dnf; Charli Seddon and. Kim Takeuchi. Series Overall Winners; Men: 1. Julius Farley. 2. Curwin Andrews. 3 Emrol Amsterdam. Women: 1.Rosmond Johnson. 2 NiMade Oniasih. Lisa-Anne Redfern.